But as the judgment now reveals, Dr Saleh’s promises proved worthless. Once in Kabul, Detainee 806 ‘disappeared’ for a month. When he did finally meet two British Army personnel, he told them he had been beaten with steel rods about his legs and feet, punched in the head, torso, arms and testicles, and deprived of sleep for days. If US-trained personnel were “already” in control of Pol-e-Charkhi in early April of 2010, it’s hard to imagine they weren’t in control in the January to February time frame when this torture took place. And it took place under the rubric of the multicolor certificate issued by Robert Harward. It should be noted here that the bulk of the allegations of torture are against the Afghan National Directorate of Security, or NDS, which is Afghanistan’s intelligence force. 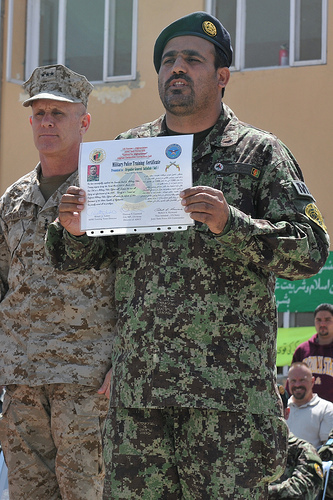 Those trained by Harward’s group are in the Afghan National Army. But the claim from ISAF is that the ANA Military Police are in charge of the facility (it has to be the same facility given the volume of prisoners passing through) where the NDS is accused of carrying out the torture when conducting interrogations. But with U.S. Special Operations Forces capturing scores of prisoners each week in aggressive nighttime raids, the United States for now must choose between releasing many prisoners after a few hours and handing over others to Afghan authorities, despite what current and former Afghan officials say are real reasons for concern about the security and effectiveness of Pol-e-Charki. Of the 3,000 people detained by the coalition between August and January, 32 percent were transferred to Afghan authorities for detention in facilities including Pol-e-Charki, and 4 percent went to the U.S.-run prison. More than half were released in the initial screening period. So while the Daily Mail case is important in exposing how British authorities tried to hide evidence of one prisoner being sent for torture, we shouldn’t lose sight of how the US sent thousands for torture, under the “protection” of military police we trained, during the same period. Oh, and if that isn’t horrifying enough, that prison was also where the US sent 250 prisoners released from Guantanamo between 2007 and the time when this Adam Serwer article was published in Setember of 2009.